Tomorrow I am setting out on my motorcycle to explore the coast around Northern Ireland from the Derry border at Muff in Co Donegal to the Armagh border near Omeath in Co Louth. In the Google Map below it is a distance of 491 kms (305 miles). The weather looks good for the week ahead and I estimate that this will be a 3 or 4 day trip. 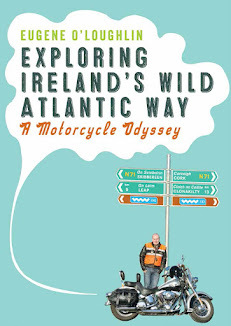 In my trip last year and the year before around the Wild Atlantic Way I averaged 250 kms per day, but this time I will spend a bit longer in some of the cities and towns. The journey incorporates the Northern Ireland Tourist Board's Causeway Route which is officially 120 miles (193 kms) long. I plan to tweet and blog along the way, and to take plenty of photographs. With a bit of luck I will produce another book based on this trip - this time I plan to go through Amazon's Createspace self-publishing route.